Hello my stamping and card making friends! Today is the Simon Says Stamp blog hop featuring their brand new Valentine's Day release called "You Have My Heart". You can find ALL of the new products by clicking the image below. There are so many adorable lovey products in this release, but today I am going to show you two of them and some projects I made using these two products. The first is a set of watercolor cards I designed. There are 12 designs, each 3x4" and printed on Ranger watercolor paper. They are made to paint or color and use as valentine's cards for you or your kids. See, these are just begging to have color added! Here they are all colored in - see how much better they look???!?!?!?! The next product that I used from the You Have My Heart new product release is a stamp set I am totally in love with called Roses For You designed by Shari Carroll. I made four cards and a tag with it! I didn't have the die that goes with it, so I fussy cut each item (saves money, but NOT time!). For this card, I stamped the heart and flowers in the set multiple times with Black Archival Ink by Ranger (water proof) and painted them in with watercolors. I use Canson Mixed Media paper as it is thinner than watercolor paper and more white making it easier to cut the images out (90 lb instead of 140 lb). I made the background of the card using texture paste colored with Picked Raspberry Distress Ink and a SSS tiny dot stencil to apply. I die-cut the background with the large scalloped rectangle in the Blueprints 20 by MFT. The sentiment is stamped on a stitched banner from the same blueprints set. I added some stamped leaves to each side to finish the card. For this card, I made the background with the MFT Swiss dots stencil and texture paste. I colored it with Spun Sugar Distress Ink for a nice pale pink color. I painted stripes with watercolor on Ranger watercolor paper and die-cut them with a Lawn Fawn stitched rectangle die. Next, I stamped the heart and the largest flower/stem and watercolor them. I cut them out with a white border showing and glued them to the front of the rectangle panel. Last, I stamped the words I love you and cut them out leaving them white so they would stamp out against the background. For this card, I again painted a striped background on Ranger watercolor paper and cut it out with a stitched rectangle from the Lawn Fawn set. I mounted that on a white yardstick base. I stamped all of the little flowers and leaves and dots in the set and painted them with watercolor. I cut them out with white borders and arranged them in a wreath shape on the front of my card. I stamped the words Love You on the inside of the wreath and painted them in as well to match the wreath. I added some PPP 4MM Sparkling Clear sequins around the wreath to finish it. For this last card, I started with a card base cut from watercolor paper. I added a watercolor wash to the background using pinks and yellows. I stamped the sentiment on a stitched banner that I painted as well. I stamped and painted the floral heart and some of the flowers with stems. I cut them out and placed them on the card front. I added some PPP sequins in yellow. For this tag, I die-cut it from the Tag, You're It set and stamped it with the Birthday Tags set. I stamped the heart and two flowers, painted them and cut them out and placed them on the front of the tag. I drew a little xoxo on the bottom and finished it with some PPP Marshmallow 4MM sequins and twine. Last, I stamped a wreath with the stamp set and doodled a quote inside it. See how versatile this set is??? Just amazing! Such wonderful cards, so different, and all from the same set. Thank you for inspiring! How adorable!! I love the work you put into these charming cards - such detail and amazing coloring! As I was scrolling down, with each card I thought, 'Oh, I need to comment how beautiful that card is' and then the next one would be even more beautiful. You did SUCH an amazing job. The colors, using the heart to create a flower. Just fabulous. Wow! Just absolutely amazing! So gorgeous...every single thing you did!!! 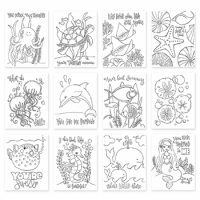 Wanda - you have been having the time of your life coloring and making all of these beautiful creations! TFS - thanks for the HOP! Have a blessed day and Happy New Year 2016! I will start again - Suzy - you have been having the time of your life coloring and making all of these beautiful creations! TFS - thanks for the HOP! Have a blessed day and Happy New Year 2016! I so glad you featured this stamp set as I really wanted to see it used. LOVE the results - your watercoloring is so-o-o pretty! Wow, I love these cards. That last wreath one is sooo pretty. Great sentiment, but the design could be used for so many different cards. So so cute! I've been wondering about those cards you designed. The white accents make them even more adorable. great job on showing this stamp set!! Wow, you have been busy! I love every card!!! Terrific Suzy! Makes me want to create! I love Simon Says and thanks for the giveaway chance! Love your gorgeous cards and the watercolored pages are stunning too! Great ideas!! Love all of your work. Love the colors and the way you put them together. Wonderful!!!!! I LOVE this stampm set, it's now om my wish list....dies are sold out! Wow, you have been very busy! I especially love all the creations using the Roses for You stamp set. I just purchased it so I thank you for all the wonderful inspiration! Amazing, beautiful cards!!! I love your idea of putting the hearts as petals to make a flower! I love all your goodies. have gotten the watercolor preprinted cards and it is great to see them filled it - gives me a better idea how to use. You paint with such warmth. Those cards look like more fun than a coloring book. wow!!!! you have been super busy!!!! Gorgeous projects you have made! I love them all! such great colors and layouts!!! Thank you for all the wonderful ideas!!! such pretty cards - love them all!